to enter as part of journey planning. But in order to make use of this information (unless one wants to risk running along a busy platform through gathering crowds as the train arrives), one needs to know from what direction a Tube train will pass the station platform. Is there a general way, while standing on a platform, to determine — perhaps from subtle signage clues, or track arrangements, or even something about the infrastructure of the platform — from which direction a Tube train, especially a deep tube train, will pass the station platform? Is there a way to anticipate (other than an announcement) the sequel while riding on a train: on what side the doors will open? For the most part, tube trains travel on the left. So, if you have a reference to the other platform, you can deduce in which direction the train will be travelling. On a few of the older cut-and-cover lines, we have two tracks running down the middle with platforms on either side (i.e., you can look across the tracks and see the other platform). For example, this is true at Monument, Sloane Square, Fulham Broadway, Cannon Street and many other stations on the Circle/District lines. Here the trains travel on the left. At smaller, newer stations where there is only one line, the platforms are usually in the middle of the two tracks. Sometimes there is a single "island" platform (e.g., South Kensington) but on the deeper lines the platforms are separated, in their own tunnels: either way, the principle still holds. Again the trains travel on the left, so you can use this to infer the front of the train. As a result, deep tube trains generally run to your right as you stand on the platform facing the tracks, while sub-surface trains run to your left. Rarely, trains run on the right (e.g., the Northern line at Bank and at London Bridge). 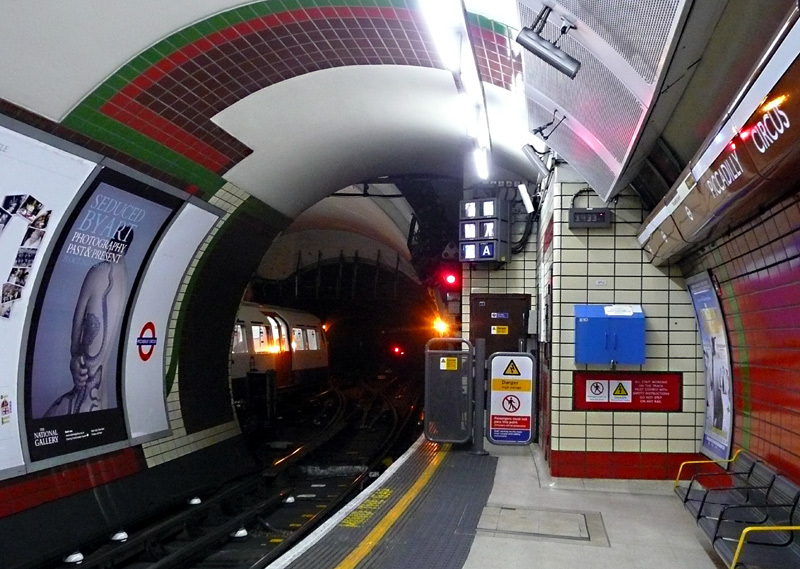 As a result, deep tube trains sometimes run to your left (Bakerloo at Piccadilly Circus, Oxford Circus, and Embankment; eastbound Central trains at St. Paul's) and sub-surface trains sometimes run to your right (westbound Circle and District lines at Mansion House; Northern line at Bank and London Bridge). At the platform you may be able to spot the the clear ("go") signal lights (white for deep lines, green for all other lines) located at the driver's end of the platform. This is probably only going to be illuminated when the train is already there, of course, but you may be able to see the light regardless. In the end, once you do a journey quite often you will automatically find yourself going to the most optimal part of the train and it becomes second nature. If you are only doing it once, it probably is not so important. Look for the end of the platform with TV screens. These are at the front of the train in the direction of travel because the driver uses these screens to view when it is safe to close the doors. Ask a station attendant (if there are any) or one or more people waiting. Which direction are the local riders watching for the train. Which end of the platform has White (Victoria and Central) or Green (all other lines) signal lights. Which way are other trains going (you'll also have to note the type of platform Transfer and Local vs Express). This is often useful on the Circle, District or Hammersmith & City Lines. From which direction is the breeze coming. To know which side the doors will open will require either local knowledge/experience, or station maps. MTA / New York City Subway has the station maps on their website. I would expect (don't know though) London Transport to has the same. Look at a map to determine the cardinal direction of the track for your line in the direction of your destination. For instance, let's say you are at Aldgate waiting for the Circle Line anticlockwise toward Euston and Kings Cross. The standard tube map, which should be posted in the station, shows the line running north; but this map is only schematic and may not always be geographically accurate. Standard online map apps, such as Apple Maps or Google Maps, have a transit layer which shows transit lines overlaid on a street map, which show, with reasonable accuracy, where the lines actually run. (If you don't expect to have mobile internet access underground, the Google Maps phone app at least will let you pre-download map tiles with the "Offline Areas" feature.) This shows the line actually runs to the northeast. If your smartphone is equipped with an electronic compass (for instance, recent iPhones have a Compass app), you can orient yourself in the appropriate direction. Or you can carry a magnetic compass with you (though you might look a bit silly checking it). Or, you can note your orientation (with respect to the streets) as you enter the station, and try to keep track as you turn corners within the station. While thinking about this question, I found a web site with diagrams of London Underground stations, 3D maps of every Underground station. Using this does require Internet access, not just on-the-platform observation. For example, at Tottenham Court Road the front of the Eastbound Central Line trains is at the ticket hall end of platform 2. The platform is on the right side of the train, facing forwards. The enthusiast map at http://carto.metro.free.fr/cartes/metro-tram-london/ shows, among other things, where the platforms are located relative to the tracks at each station. Knowing that the trains usually run on the left (the exceptions are noted on the map too, notably Central Line at White City, Northern Line at London Bridge and Bank, and Victoria Line between Warren Street and St Pancras), this should enable you to predict which direction the train will go when you stand on the platform facing the train. One thing that surprisingly hasn't been mentioned; there's usually a digital (or possibly sometimes analogue?) clock right at the end of the platform at which the front of the train stops. In this photo the digital clock is above the blue box on the right. Not the answer you're looking for? Browse other questions tagged public-transport london london-underground or ask your own question. Is there a guide to underpasses in London which don't access Tube stations?